May 29th, 2018: RIS Inches Up Further—Eyes On The Sky! 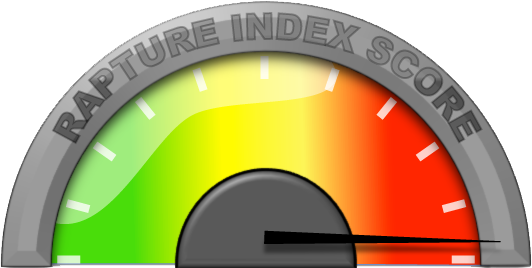 It has been ten months since we updated the Rapture Index Score. It's been an unbelievable ride with an incredible number of "unknowns." For that reason, we felt it was in everyone's best interest to let things play out to see how additional pieces of the puzzle connected—and so much was revealed. There have been an overwhelming cacophony of political, economic, societal, religious, and astronomical signs occurring since the Revelation 12 Sign in September 2017. We've done our best to document these for you, so little else needs to be said here aside from the fact that we are nearing nine months post-Revelation 12:1–2 and if that was indeed the Church's "exit sign" the world is frighteningly close to judgment and the Church's disappearance. It's nearer than any of us probably realize. At this time we don't readily see anything else that needs to happen to more perfectly align prior to the rapture aside from, possibly, the passage of the Jewish Nation-State Bill. We are closely monitoring developments related to that legislation since it has already passed a key committee vote and its first full reading in the Knesset. It's passage would no doubt make 2018 as prophetically significant as 1948 and 1967—'48 the land, '67 the city, '18 the people. There is one caveat to the above point: a number of potential candidates for fulfilling the subsequent sign of the dragon in Revelation 12:3–4 have been presented, but haven't seemed quite as compelling as the perfect Revelation 12:1–2 alignment on September 23rd and 24th last year. Our judgment is based on this interpretation of the sign of the dragon, which concludes that Revelation 12:5 will precede or occur simultaneously with Revelation 12:3–4. - A spiritual sifting seems to be nearing its end with fewer and fewer people still on the fence. The world has never been more politically and spiritually polarized than it is now and that ties into several prophecies. - The cashless micro-chipping fad has reached critical mass in Europe. - While eugenics/transgenderism/abortion/liberal social engineering have run into a stumbling block in the U.S. under the Trump Administration, the wave of lawlessness has continued to crash over the rest of the planet. Ireland's pro-life 8th Amendment was voted down in a referendum and the British government has begun jailing political dissidents. - Livestock around the world have just recently been hit by some very deadly plagues leading to their mass slaughter. Hundreds of thousands in New Zealand, alone. In addition, a historic trucker strike in Brazil is threatening over 1 billion farm animals in what could be a catastrophic development. - The daily number of worldwide earthquakes over 2.0 on the Richter Scale have inched up to the point of hitting the highest number in at least four years just a few weeks ago. 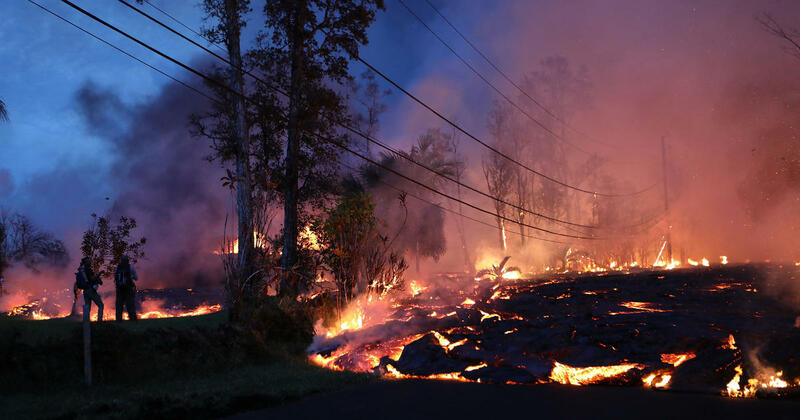 - The Ring of Fire is currently experiencing a particularly active period and this is most publicly seen in the ongoing Kilauea eruption in Southeastern Hawaii. The Rapture Index Score (RIS) is our measure of how close we believe we are to "the glorious appearing of our great God and Savior Jesus Christ" (Titus 2:13) and the Church being gathered to Him (1 Thessalonians 4:16-17) based on a number of prophetic factors mentioned in the Bible as pertaining to the time leading up to the Tribulation. For an expository explanation and in-depth discussion, please refer to our post "How We Measure". I truly believe the Great Tribulation is about to begin with the sign of Rev 12 happening on September 27th, 2017. I think the rapture if there is one, will happen within the next four years, after the antichrist is revealed. Hi Anon, The Rev 12 sign occurs on 9/23/17. Blessings! Can someone plz explain the significance of 9/23/17. Why is this date SOOO important ??? Blessings Anom: The Revelation 12 sign will appear in the sky that day. The past 6000 years and the future 1000 years have been checked and this will be the ONLY time this sign will occur (the Bible calls it a "great sign"). Rev 12:1 A great sign appeared in heaven: a woman clothed with the sun, with the moon under her feet, and on her head a crown of twelve stars. Rev 12:2 She is pregnant—crying out in birth pains, in agony to give birth. Rev 12:3 Then another sign appeared in heaven: a great fiery red dragon that had seven heads and ten horns, and seven royal crowns on his heads. Rev 12:4 His tail sweeps away a third of the stars of heaven—it hurled them to the earth. Now the dragon stood before the woman who was about to give birth, so that whenever she gave birth he might devour her child. Rev 12:5 And she gave birth to a son, a male child, who is to rule all the nations with an iron rod. And her child was snatched away to God and to His throne. Rev 12:6 Then the woman fled into the wilderness, where she has a place prepared by God so they might take care of her for 1,260 days. Sometime shortly later Saturn (satan) and Mercury the Messenger (Michael)go into conjunction and it appears as if they are doing battle. In addition, the Feast of Trumpets is on the calendar to start at sunset 9/21/17 and end on 9/22/17. HOWEVER, if the first slivers of the new moon aren't sighted in Jerusalem (2 witnesses need to testify to the Sanhedrin)on the night of 9/21, that could put off the feast of trumpets to 9/22 - 9/23/17. Because one never really knows ahead of time for sure when Feast of Trumpets starts. Hence the Jews know this feast as "No one knows the day or the hour." Also, on the Feast of Trumpets, the shofar (trumpet) is blown 3 sets of 33 times (99 blasts) and then a final long blast the Tekiah Gedolah - known as the "last trump". Dr Michael Svigel of Dallas Theological makes a very good case that the man-child being born is the corporate BODY of Christ (the Church), as opposed to most people's interpretation of it being just Christ Himself. The word for this snatching away of the man-child is, in Greek harpazo (rapture). Basically, MANY believe this could be the rapture. I'm NOT saying it is the rapture, but the evidence for this is pretty impressive. If we are still here then, I will most definitely be looking up around that time. However, we are in a very high watch time for the rapture from now until a few days after 9/23/17. We're on an ever accelerating roller coaster; the election of Donald Trump was one of the small rises that slow you down just before the big one. We've just cleared the top of the small rise, and now are just beginning the massive drop, the mother of all drops. For some it will be an exciting ride, for they know their King comes to take them to his bridal chamber, to hide them until the indignation passes. For those who have decided to follow other gods, the ride will be the most frightening ride they have ever experienced. Their gods cannot save. Chose this day whom you will serve, before it's too late. Only Jesus saves. How did the election of Trump slow anything down? You are delusional. Go seek mental health help. good lord. i hope the rapture hurries up and removes all these idiots from my planet. Our Lord is Good and if you would be serious long enough to look into this you too would understand why us "rapture" nuts are all looking this year for His return. Do you know Jesus or are you just going to follow the rest to slaughter?? Amen, we look every year, but this year is WAY up there on the "even more possible status"! When it happens you won't think we are idiots any more as you will have to suffer through the tribulation and possibly be tortured and killed or spend eternity in hell. This website is my favorite by far. Up to date with current events, sound and reasonable, doctrinal and very informative. Thank You!!!!!!!!! Thank you PJG. You are spot on. Very good synopsis. I would like to share your comments if that's ok. Blessings in the name of Jesus Christ our soon coming King. Maranatha! Hallelujah! Amen! Thank you for your very kind words. Absolutely, please feel free to share my comment, it is to His glory. The King IS coming VERY soon, Maranatha! I'm still trying to decide whether to give the Sept. 23 sign credibility. I hope and pray it's truth. One must know astronomy to verify. I'm so ready for His return! What does Planet X have to do with this? Nothing? I saw same information but with other things.. Were we not told we would not know the day of our Lord? It is wrong to say that this sign is definitely going to be right before the rapture. Whether or not it is in the season, we don't know. All we can do is wait. Blessings Anon, Did someone here say that this sign would definitely occur right before the rapture? If they did, I certainly missed it, please point it out to me. This doesn't even scratch the surface of all the signs. I don't know how anyone, just taking a cursory glance at the subject, could not be convinced we are in the season. For better or worse, that is the impression most have re: the Rev 12 sign and 9/23. This is a great website and I thank God for it, but if the rapture and/or cataclysmic events don't happen the September, a good # of ministries will have essentially destroyed themselves attaching themselves to this sign. Right or wrong, no one is going to pay attention to Scott Clarke and many others ever again. Yes, when a forecast is wrong, many do dismiss the next one. Or, worse, they'll give credence to the legions who mocked the "sign". Personally, I hold a ministry to a far higher standard than a weatherman. I doubt many paid attention to Harold Camping after his failed predictions, other than to mock him. That's not to equate this website or many others with Camping other than to note the principle, but the fact is this website, and many websites and ministries, have been putting the Revelation 12 sign at the forefront of their ministry for 2 or 3 years now. If the sign passes with no significant event, many will have crippled or destroyed their ministry. I don't see how that's even debatable. Scott Clarke has made video after video on Rev. 12 the last few years. If he's been wrong about this, very few are ever going to take him seriously again. And he has all but promised the rapture on 9/23, regardless of whether people try to downplay that or not. Which is why it's an enormous mistake for any ministry to tie themselves to a particular date, in any context. They have said over and over, it is a high watch time. They said they have no trouble repenting if wrong. Luke 17:3, if they repent it is your job to forgive. PJG, Not to mention all the police shootings of innocent citizens all over America, and vice versa. It never ends! We've had 3 in Minneapolis alone... 2 innocent civilians and 1 reaching for his gun. In the Philando Castillo case, the cop walked free! Then there's the current Australian American woman. Shot for NO reason whatsoever! This stuff never used to happen till a few years ago! "observers in South Korea were able to determine from North Korea's most recent ICBM test that the missile would put Chicago in range and possibly even the entire United States"
They are no more a danger to us with their arrows than the Congo is. I would put that Missouri Gravity Low and the 1700 mile long crack in the continental United States far above Korea. I don't like this eclipse in three weeks' time, as I have read the connection between Mt St Helens and the Guidestones. The path of 21 August is over that 1700 mile long crack, and this eclipse passes over those Guidestones. I don't like this eclipse at all. I don't either. I have very good friends who live in Kentucky and I am really considering asking them to come up here (Michigan) to visit. BTW "Jacob's Trouble" refers to Gog and Magog because Jacob is still in Diaspora not in Israel; Jesus gathers the "Dry Bones" (Exe 37) of Israel at the 2nd Coming, and start of the Millennial Reign on Earth. Refer to Amos 7:2-3; 5-6KJV "Jacob shall no more rise"
I miss the old Rapture Index Score tracker. Contractions are 60 seconds apart! Will this be updated to account for recent events? Nathan, I believe this index is updated weekly. Should the volcano score get bumped up? Thank you for the rundown on the update for the RIS. As we all know, it matters not what we say but what G-D is doing. I would like to say that I would be "ready" but honestly? I don't believe ANYONE will be ready for what is coming. If we (individually) live to see the Day, the best I think we will be is "present". We have all been witness to these catastrophic and prophetic events. We can take them for what they are or we can know in our hearts that the time of our birth (again) is near. I am praying daily and keeping busy about the work of our Father as best as I can. Even so, I tend to wonder if anyone will truly be "ready". How can we be ready for the raw and unleashed power of G-D Almighty? It is something I have been pondering more and more. Grace alone will make believers ready! I am reminded of (Daniel 10:8-11). Daniel's encounter is much like that of John's of (Revelation 1:17). Yes, it is by His grace that we would be ready. But of ourselves? Not even close. Tactful, fact based, spot on. Thank you. Funny, what hit me the most was the first line: "A spiritual sifting seems to be nearing its end with fewer and fewer people still on the fence." The subsiding evolution of the online church community's response to the event, and then the folks response to THAT, aligns with this. I thought this sounded oddly 1st-person and had to re-read to make sure the words, "I feel that..." didn't start the sentence. The Lord has me using a nice, efficient public transit system this past year, somewhat of a personal culture shock and a small cross for the fam to bear, but there it is. In my spirit, I know it has exposed me to dynamics I wouldn't be aware of, in the streets, as I am now. Your sentence strongly resonated, as I have commented at points, with the very subtle yet very definite and PERVASIVE feeling 'shift' as you say. Anyone else or just the 2 of us? I can vouch for "shift" as TV commercials on the mainstream American networks are shocking. My family was just on holiday and enjoyed watching some satellite TV. (We don't have cable or satellite TV at home so it was a treat to watch NBA Basketball) I would rather not go into details but the stark contrast of 40-years ago to now? Even 10-years ago to now? Further down the rabbit hole they go. In the last several days, I have been pondering the shift. I had definitely noticed. Trumps election polarized people; they picked sides. Ironically, the sides are both evil, mostly. I see evil against evil in a lot of the political arena. And Richard, I can see a stark difference between only two years ago and now. Richard, yes, as a window into our collective ‘soul’, the TV illuminates much. Sherry Griffin, “I no longer by green bananas and they're focusing on 10 year business plans.” Wow, truer words were never spoken, amen! That this ‘shift’ is so visible EVERYWHERE, albeit it looks different among believers than non-, is part of what commanded me to make my point, Maranatha! Miguel P, Sifting & Hardening, yup, over the target. Gary, Rev 22:11, (interesting numbers & symmetry there), is a powerful engine which drives our understanding of this, absolutely. From another Watcher quietly standing post on the Wall, the view from here seems to have been confirmed by my peers, elsewhere on the Watch. Maranatha! #MADNESS# I mean utter destruction and complete confusion of mind. In the world AND among the church. Hi Annabel, in the article above 'off the fence' means choosing a side, rather than being undecided. (Just in case that didn't translate well) But I presume you mean that you are still 'on the wall' watching for the signs and waiting for our Lord. Right? Anyway, I am also watching in silence too. The Lord is near. The world and church (lowercase) has become mad and confused. I am praising the Lord for Romans 8:31-39 and 2 Timothy 4:8. Yes, I’ll vouch for a big time shift in fact! However it bothers me that those closest to me don’t see the same, or at least not the magnitude that I see/feel it. I was just visiting this section of the site yesterday for the first time in months. Apparently the Holy Spirit is speaking to us more clearly and uniformly than we may realize! Today is rainy in St. louis , MO and as I look at the rolling clouds shrouding the heavens, I long to see my savior. I sense the immensity of His power, the depth of His desire for us, and the utter closeness of His call. When I spend time with Him in prayer and worship, He comes near and confirms what He has placed in my heart. The Rapture will come to pass. He says we do not know the "hour" in Luke 12:40. I believe He has spoken to us the year, season, and likely the month. A birth period allows us to predict within a week or so typically but not necessarily the day and less likely the hour. And so it is. And how about the allusion to the feast of Matthew 22 that occurs in Revelation 3:20? While we await the hour, let us attempt to gather as many as we can. May we be one in our purpose to fulfill His calling, and courageous as we invite the people on the "street corners." Do not fear man's rejection. Let the Holy Spirit go before you. Pray without ceasing. Be filled with His mighty Spirit and tell everyone who will listen. They will want to come to this party and we will want to have asked them to come. This is the final call. And God we humbly come before You and request Your sovereign hand to guide us, guide our words, our eyes, our footsteps and our minds. We need your wisdom for what to say to a world captivated by the enemy. Go before us and open doors we cannot open. Take down walls we cannot raze. And empower your people with opportunity. Do as You will whatever it takes to turn the attention of the world to the Your Blessed Hope! In Jesus' name. Amen. Something occurred to me last night. Jupiter was in Virgo's womb for 42 weeks and came out in September 2017. For that reason we never thought to look 9 months ahead. However, if Venus is Christ, the Morning Star, and Jupiter is Christ as a man (stripes, spear wound, crown, and all), then perhaps the Jupiter retrograde symbolized the conception and birth of Christ as the HEAD of the Body. Perhaps the Church was not meant to be symbolized by Jupiter. Perhaps the Rev 12 Sign kicked off a new pregnancy, this time for the Body and not the Head. Thank you for that beautiful prayer and blessing. Our church outreach is based upon taking ownership of the seat to either side of you at church and filling it with a guest. We call this "Come&See" and base it upon (John 1:46). This is something we can all do and something we can encourage our congregations to do as well. Even if we are inviting just one person to come and see over coffee or tea in our home or at a coffee house - even you Annabel could manage that I would imagine. Prayer is our key. Constant and committed prayer is our key to preparedness. No strength of our own will endure the moment. His strength alone will sustain us in the sweeping tide that washes us Home. That is an interesting thought. I have come to believe that the R12 Sign is, in its most basic of terms, a marker in time. A milepost as it were telling us "You Are Here!" Without it, how would we know the days? Wars and rumors of wars have been with us through the ages. But how would we KNOW that this is it? The Great Sign tells us. It tells us the days we are living in. Scripture is not monolithic. It is dynamic and living. It is life itself. It is well understood as a diamond that reveals definition through its many facets when light is shown and viewed from different angles. Like truths inside of truths we see clearly from different angles. I expect such a message is the most basic thing for our Father to convey. How deep the mystery? How great the wonder? How profound is His truth? Our G-D is both boundless and a singularity. His holiness and power beyond comprehension. For this reason I believe the R12 Sign is many things both simple and profound. You have proven that in the work of your hands in this very website! Perhaps your revelation is just one more aspect of that great truth that is hidden within The Great Sign. Many of my thoughts about the R12 Sign are the same. -A sign to the Church that the time is at hand. The male child is about to be born again into Heaven. -A sign to Israel that they (the woman) are about to enter into the prophesied time of trouble. -A sign to the world that God's Word should first and foremost be trusted for its plain meaning. Revelation isn't to be dismissed and allegorized away, but trusted for what it says. God's Word is trustworthy. When is a child considered "born"? I am a father of three and have cut three umbilical cords in my time. All sons. Are we born when the head or an arm emerges or when we are fully out? The midwife in (Genesis 38:28) tied a red thread on the hand of Zerah and used that to determine which of the twins was born first. I don't think this picture defines our birth. Our birth, our final birth, is to be to the full and complete. If Christ be the Head and we the Church His body, then there can be no breach birth. It will be full and complete. Pressure will continue to mount. Contractions will come. Will they be with greater frequency? It certainly seems so! But knowing that once the head is out, the body follows soon and with a RUSH!!! All that I know for sure is that there is a great and glorious birthday coming and everyone is invited. I don't have to worry about the date for in that Day I (we) will be caught, delivered, right into the hands of our Father in heaven. The Great Physician will catch us and the cord that binds us to that which sustained us in our time on earth will be cut. Severed forever from the world that was our temporary home. May we have the trust of a new born babe in the arms of their mother in the times and time to come. Not that I'm saying this to you Gary, but more to those who come in our footsteps and read these things wondering what has happened and why? Dear Richard, just to clarify with regards to the "Come and see" concept: We've done that for YEARS in fact. We have invited homeless, beggars and needy whoever got to our door all the time since salvation in 2005. When I was still working as a chamber woman in a rehab clinic for burnout and depression I would talk to many patients (Christians as well as atheists and seeking persons) about Jesus during and inviting them to our home to explain them better as I was forbidden to talk much of course as I had to clean their rooms. I was indicted of sharing the gospel and spreading bibles during work by the way after the LORD let me do this for 3 full years and I had to quit. It was rather a 'dusting off feet' then. Since 2016 the LORD has closed the door for preaching and inviting on the fence. I'm not saddened by this as it is His will at my place and we're not anymore called to preach. It may be otherwise at your place but just FYI as it seems you are unaware of my situation in Germany. You have no idea how many people have "come and seen" our preaching and counseling / exhorting ministry as I haven't documented them but this ministry has ended. MARANATHA! You're right Annabel, I don't have the slightest idea of what things are like there, or there for you. You are so right. I hope you did not think I was criticising you in any way. That was not my intention or desire. All apologies if it sounded that way! Your situation struck me as one extreme of an illustration which I hope that others will take note and be encouraged. Thank you for confirming to others here that even outside of the church we may do the same thing! Even if you are not able to continue in that today, who knows what has taken root, grown and seeded a new generation? We know that G-d knows and that He brings the increase do we not? The area we live in today is peppered with churches including other places of worship from around the world. In the place we hope to plant there are few if any churches save in city centres, with all of those mainline denominations. Thankfully, there are new families moving into the area we live in now which makes "Come&See" work. We also have two congregations that meet at our campus made up of recent immigrants. Yes, our situations are very different but that was my point. We *can* invite on both a macro scale and micro scale. (Meaning invite to church or invite to a coffee shop, park or to our home) I knew that you would be a likely example of someone who had done so on the micro scale. Glad to see that I was right! Hmm I wonder is the Great Sign of Revelation Ch.12 literally gave us a countdown clock of 9 months..? If so are we (the Church) to continue on the Earth until late June? Or are we to wait until Venus enters the Pleiades in 2020, as mentioned in Revelation 1:16 and Revelation 2:1? Just curious what everyone's thoughts are on Psalm 118. For years I have looked at 117, 118, and 119, and thought, there is something there! The dates line up perfectly. Psalm 118 is in the middle of the bible. Psalm 117 is the shortest chapter. Psalm 119 is the longest. It's 2018! I've been waiting to see what's going to happen this year! I almost feel like if it doesn't happen this year, then the dates will be based off of Israel reclaiming Jerusalem. You know, the 70-80 years generational verse. Just curious your thoughts? We will be here to see at least Israel's 73rd birthday. September 23, 2017 + 270 days (9 mos x 30 Biblical Days) = June 21, 2018. NOT setting dates, just saying. God is JUST, but He is also MERCIFUL. I believe that knowing what's coming, He is being abundantly gracious in that mercy. A BIG part of me can hardly stand the wait. I too am weary of the world's wickedness. Another part of me is scared because I know that even though I've been redeemed and my sins forgiven, I am not the person I want to be in Christ. A BIGGER part of me is scared for those left behind - most of the folks I see today are followers. They blithely go along with the MSM and current fads. Most in this country have never really had to do without. As a whole we are spoiled and soft. And demanding. PRAY for our children, for other people's children. Yep, been stressed a lot with work and home life lately, and it shows in my attitude and actions! Need to be spending more time with Him. Come Lord Jesus! Stephy, You hit the nail right on the head! Stressed a lot with work and home life lately, and it shows in my attitude and actions! Busyness (not business) gets me feeling like I'm running on empty. (And I am) Unless I dedicate some very personal, specific, hard-core, one-on-one praise and worship and prayer time with the LORD I feel useless, defeated and ineffectual. Nothing against the web or YT or anyone who posts there, but videos and posts just don't cut it. I have to have a real Bible in my hands. A cup of coffee at my finger tips and the word of G-D flowing into my heart. Having a place of my own that is set apart for worship is key for me. 89 adialeíptōs (an adverb, derived from 1 /A "not," 1223 /diá, "across" and 3007 /leípō, "to leave") – properly, nothing left between, i.e. without any unnecessary interval (time-gap). Need to be spending more time with Him? Me too. Don't we all! Pastor Rick..Your two words...unceasingly pray....are very boiled down to critical mass. I with the love of Christ can't thank you enough how I followed those words and have been unceasingly blessed since this morning. I share with one person on this planet and this person will soon be told if I can ever put it into words. Thank you Pastor Rich, that is a great reminder for me to stay steadfast in His word and promises, and to PRAY WITHOUT CEASING! This really blessed me, so thank you, again! I have come across an interesting coincidence that someone with a better background in the Hebrew language may want to look into. According to Nick Vanderlaan's Biblical Anniversaries calendar Pentecost falls on 3 June (link below). I very much hope that he is correct and that we can expect a Pentecost Rapture and meet in the clouds, MARANATHA. However, I have been researching the wheat harvest and came across a link suggesting that there were two wheat harvests (link below). This is significant for a couple of reasons. According to their interpretation of Leviticus 23:16 the 50 day count starts on the day AFTER the seventh Sabbath. The first reason that I think this may have merit is that there is currently no large military force on Israel's border ready to initiate Ezekiel 38-39. The players are obviously in place but the Soldiers aren't and it takes time to move men and equipment. The second reason I find this interesting is that this timeline would put the new grain offering on 22 July which also happens to be the festival of wine. I'm having a hard time with the idea that this is a coincidence but I don't have the background to search it out with confidence. Well, if Pentecost is this coming Sunday and the LORD calls us home this Sunday during church, then our guests who join us for "Come&See" could be in for an unforgettable Sunday Worship! Interesting stuff at HOIM. Will read on that further. As for the IDF being ready? Trust me. They are ready. What strikes me is that Russia is supporting the movement of Iranian elements from Israel's northern borders with Syria. The agreement to facilitate the movement of Hezbollah and Iran away from Israel's borders and out of Syria are interesting events. Makes one wonder how this plays into "Peace & Security" if at all? Richard, one clenches the fist before one strikes with it. Maranatha! Read an article yesterday about how Hezbollah troops near Israel’s border are being dressed in Syrian army uniforms to fool the IDF. Guess if this gal in South Carolina is reading that, the IDF probably isn’t fooled at all :). But it might make it more challenging for the IDF to selectively attack Iranian and Iranian-backed forces should they feel such an attack is warranted ... which could result in “accidental” Syrian casualties ... which could result in reprisals from Syria ... which could lead to the destruction of Damascus by the IDF. Just sayin’ ... . The Middle East is like a chessboard right now. How thankful I am that our good and Sovereign God is moving the pieces! Charissa, every word resounded in my spirit. Amen that we fight this fight and run this race together. Amen that His mercies are new every morning. Let us continue to pray for one another as the day approaches. Many are sick or struggling as we are finishing this race, tired and beaten and weak. Lord, together we unite in your precious Spirit to lift one another up, for strength, joy, faith, peace, healing, wisdom, understanding and anything else we need to help us finish well. Mostly we pray for closeness to you; may we feel you near and hear your gentle voice encouraging us. Thank you Jesus for blessing each and every one of us with the knowledge of and faith in you. We love you so much and will see you face to face soon. Amen, amen, amen! Pastor Rich is right there with you too. Every bit of what you share is where I find myself. Right down to giving away copies of "The Gospel of John" on DVD. When 9/24/17 came and went, I adopted what I call my 9-24 plan. It includes plans for the future but much more focused work for today in the here and now. "PROCEEDING BY FAITH AND HOPE TO LOVE ONE ANOTHER UNCONDITIONALLY AS CHRIST LOVES US TO THE GLORY OF GOD." Therefore we are continuing in the work He has given us for today with a hope for tomorrow, be it planting a new church or preparing for our great gathering in the sky! Miguel P., Sherry, and Pastor Rich, thank you for your words of encouragement. They went straight toy heart like a love letter from the Almighty. The Lord bless each of you! Thank you to those doing this site as well. Micah 7:7. "But as for me, I will watch expectantly for the LORD; I will wait for the God of my salvation. My God will hear me. Do not rejoice over me, O my enemy. Though I fall I will rise; though I dwell in darkness, the LORD is a light for me.". Praise you Father, for your goodness!